New iPhone 5s promises "64-bit desktop-class architecture"
Will it herald the arrival of a new generation of music making apps? 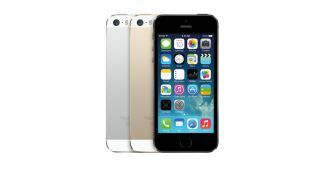 The iPhone 5s will be available in a choice of three colours. Apple's latest iPhone got its customary low-key launch yesterday, with the company billing it as "the world's first smartphone with 64-bit desktop-class architecture for blazing fast performance in the palm of your hand". Its new A7 chip is said to deliver twice the CPU and graphics performance of the now discontinued iPhone 5, while there's also a new M7 motion coprocessor. Of course, the fact that you're working on a 4-inch touchscreen means that the experience of using an iPhone 5s is never going to be comparable to working with a Mac, but these technical advances should mean that we'll see more powerful music making apps in the future. What's more, with many of us now using multiple apps simultaneously via Audiobus, a little more processing grunt is always welcome. Other iPhone 5s highlights include a Touch ID sensor that recognises the user via their fingerprint, and an improved 8-megapixel iSight camera. You can find out more on the Apple website - prices for the iPhone 5s will start at £549 without a contract, and it'll be available in gold, silver or Space Grey from 20 September. Apple has also launched the slightly more affordable iPhone 5c, which has a plastic body and will be available in blue, green, pink, yellow and white. The cheapest model costs £469 and, again, it'll ship on 20 September. Both the new iPhones will run iOS 7, which will also roll out for iPhone 4 and later, iPad 2 and later, iPad mini and iPod touch (fifth generation) from 18 September.